Last minute gift shopping? Desperate for one of Roullier White's rare and exclusive fragrances? Only in London for a brief stop-over? Never fear, Roullier White offers prompt and reliable same day delivery to our London based customers anywhere with a London postcode. 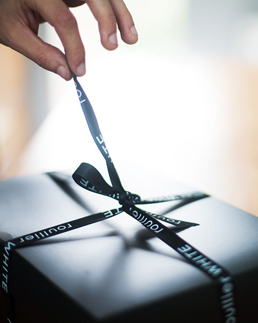 Simply call us and a courier will deliver your beautifully presented item to your home, office or hotel, with gift wrapping options also available. Orders must be placed before 5PM. Please call 020 8693 5150 with any specific requirements or if you would prefer to arrange collection using your own method. If you're not in London, don't worry! We offer next day delivery to any location in the UK on all orders placed before 3PM.